See scan - perfect condition. 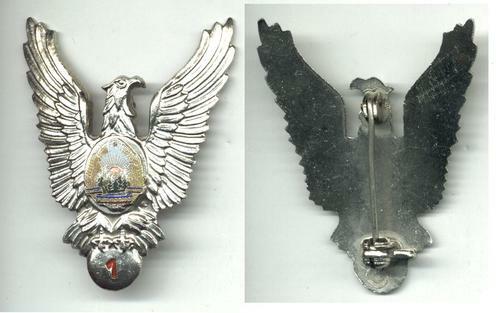 This is a nice early Romanian / Rumanian communist / socialist era pilot / aviation badge - 1st Class wings. Has an eagle holding a bomb with the Class in his claws and the Coat of Arms / Crest in the middle. Nice militaria / military collector piece and one of the nice Romanian badges.